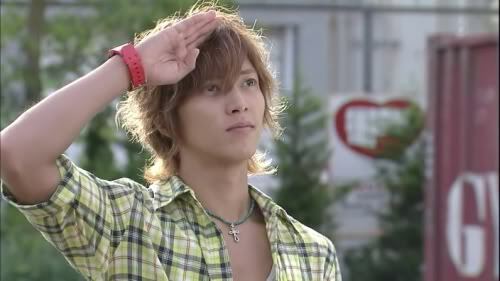 Buzzer Beat is a 2009 Japanese drama starring Yamashita Tomohisa (better known as Yamapi) and Kitigawa Keiko. This is a drama about a group of young people, it’s set in summer, mostly light-hearted, features a lot of outdoor scenes, and in general has a magical, buoyant vibe that makes it a perfect summer show. It’s a drama about two thoroughly decent, intelligent, hardworking people (played with great charm and beauty and chemistry by Yamapi and Kitigawa) who have an instant connection, become friends while both are involved with other people, and later fall in love. There’s so much magic and loveliness about the way their relationship is portrayed. Yamapi is a talented basketball player struggling to get his groove back, and Kitigawa is a self-assured, charming, endearing violinist. There is some drama and angst but it’s mostly fairly low-key and this is a great romance and a fun story about a group of friends and about growing up.